The Agrippa Files » Hodge, James J. Bibliographic Description of Agrippa (Commissioned for The Agrippa Files). Hodge, James J. Bibliographic Description of Agrippa (Commissioned for The Agrippa Files). Unlike most library bibliographic descriptions, this bibliographic description of Agrippa (a book of the dead) does not, and cannot, have one “object” per se. The bulk of the observations and measurements in this article are based on examination of the copy of the deluxe edition at the New York Public Library in the Rare Books Division (hereafter “the NYPL copy”). Also examined was the “Archive-1” copy of the deluxe edition (so labeled on the inside front cover) that publisher Kevin Begos, Jr., provided to The Agrippa Files site in the form of digital photos (with permission to show selected pages on the site). (Begos also allowed The Agrippa Files editorial team to inspect the Archive-1 copy physically during his visit to Santa Barbara on October 29, 2005.) A promotional prospectus for Agrippa, owned by the Whitney Museum of American Art, was also consulted, as were other images of the book gathered from publicly available textual and web resources. The rationale for providing a comparative bibliographical description that is based upon—but does not adhere to—a single copy arises in part from the scant copies of Agrippa available to the public. But also relevant is the fact that elements of the work were created or finished by hand: each copy of each edition is physically different. The main purpose of this article is to provide a working guide to the textual variants in the examined copies. Users of The Agrippa Files are encouraged to contact its developers concerning other artifactual discrepancies and significant variants. However, the project was conceived by publisher Kevin Begos, Jr., and the code for the software that scrolls Gibson’s poem as well as for the encryption program (sometimes mistakenly called a “virus”) that subsequently erases that poem was written by a programmer signed “Brash” (who desired to remain anonymous) with help from John Perry Barlow and John Gilmore (founders of the Electronic Frontier Foundation). The DNA-sequence (C-A-T-G) typographic layout and the idea that the format of the book should embody the whole history of the book from the print to digital eras was Begos’s inspiration. The deluxe edition’s type was set at Golgonooza Letter Foundry, printed by Sun Hill Press and Kevin Begos Jr., editioned by Peter Pettingill, and handsewn and bound in linen by Karl Foulkes. The small (what the Center for Book Arts calls “regular”) edition’s type was also set at Golgonooza Letter Foundry and printed by Sun Hill Press. The reproductions of the etchings were printed on a Canon laser printer and Smythe sewn at Spectrum Bindery. And the promotional prospectus of Agrippa was designed and constructed by Dennis Ashbaugh and Kevin Begos, Jr. Many hands thus contributed to the making of Agrippa. Recognizing all these creators gives a sense of the work’s multi-dimensional artifactuality and its aesthetic negotiation of materiality and ephemerality. In his article “Agrippa, or, The Apocalyptic Book,” Peter Schwenger has suggested a few possible antecedents for the idea of a “disappearing” book, including works by Mallarmé and Blanchot. The name “Agrippa” is taken from a brand of Kodak photographic albums sold in the 1920’s. (William Gibson’s poem opens with a description of the snapshots in his family’s old Agrippa album.) All the albums in this Kodak product line were named after classical, mythological, or literary gods and heroes (for example, the “Hercules,” “Apollo,” and “Othello” albums). But except in this generic way, there seems to be no connection between Agrippa (a book of the dead) and the King Agrippa of Acts in the Bible, the first-century Roman military leader Agrippa, or Agrippa d’Aubigné the seventeenth-century French writer. The type, Monotype Sans Gill, was designed by Eric Gill (1882-1940), an eccentric British artist and letter-designer. For the layout and dimensions, publisher Kevin Begos, Jr., took his inspiration from the 42-line Gutenberg Bible, the first book (c. 1455) printed in Europe with movable types. (See, for example, the leaf from the 42-line Gutenberg Bible in the UC Santa Barbara Library < http://agrippa.english.ucsb.edu/post/developers/uncategorized/gutenberg-bible > or the Gutenberg Bible in the British Library < http://www.bl.uk/onlinegallery/themes/landmarks/gutenberg.html >. The distressed, rusted honeycomb “bed” of the deluxe edition and also of the promotional prospectus (the bottom part of the case in which the book is nested, over which the case cover is placed) may be conceived as an homage by artist Dennis Ashbaugh to his mentor Frank Stella’s (b. 1936) own work with metallic honeycomb. The newspaper advertisement source images for the “overprints” superimposed on Dennis Ashbaugh’s etchings were taken mostly from New York Hudson River Valley area newspapers from the 1920’s and 1930’s. The source for the DNA sequence on the body pages of the book (the C-A-T-G text in 42-character columns) is from a portion of the bicoid maternal morphogen of the fruitfly. See The DNA Code. Three copies of Agrippa (a book of the dead) are known to be in the collections of libraries and museums: a deluxe edition at the New York Public Library in New York, NY < http://catnyp.nypl.org/ >, a small edition at Western Michigan University in Kalamazoo, MI < https://www.library.wmich.edu/ >, and a deluxe edition at the Victoria & Albert Museum in London, England < http://www.vam.ac.uk/nal/catalogues/ >. Neither the Library of Congress nor the British Library owns a copy. The Frances Mulhall Achilles Library at the Whitney Museum of American Art in New York, New York < http://library.whitney.org/ > has a promotional prospectus of Agrippa. The deluxe edition of Agrippa was set in Monotype Gill Sans at Golgonooza Letter Foundry, and printed on Rives heavyweight text by the Sun Hill Press and by Kevin Begos Jr. The etchings were made by the artist and editioned by Peter Pettingill on Fabriano Tiepolo paper. The book was handsewn and bound in linen by Karl Foulkes. The housing was designed by the artist, and the software (including the program that scrolls William Gibson’s poem and the encryption code used to destroy the story was created by (BRASH), with help from several other individuals who will go unnamed. The regular edition of Agrippa was also set in Monotype Gill Sans, but in a single column page format. It was printed by the Sun Hill Press on Mohawk Superfine text, and the reproduction of the etchings were printed on a Canon laser printer. The book was Smythe sewn at Spectrum Bindery and is enclosed in a clamshell box. A previous, working description of the New York Public Library copy by Matthew G. Kirschembaum, Professor of English at the University of Maryland, can be found on his blog at < http://www.otal.umd.edu/~mgk/blog/archives/000804.html#more >. Correspondence with Kevin Begos, Jr., publisher of Agrippa (supplemented by an interview with him during his visit with The Agrippa Files editorial team in Santa Barbara on October 29, 2005) has also informed the present article. The deluxe and small editions of Agrippa (a book of the dead) were published in 1992 by Kevin Begos, Jr., Publishing in New York, New York. The promotional prospectus was sent out in late 1991. The deluxe edition of Agrippa was originally priced at $1500. The price was later changed to $2000. The small edition was sold for $450. Two editions of Agrippa were published: a deluxe edition and a small edition. There are three permutations of these editions that have caused confusion over how many editions exist. The Victoria & Albert Museum owns what it terms a “deluxe artist’s proof edition” numbered 4 of 10. This edition is actually a deluxe edition. (The ten designated copies of this “edition” should be included in the count of the deluxe edition.) The Whitney Museum of American Art owns a promotional prospectus of the book, which is a much simpler object than the book in that it has no pages or case. There is also one “mock-up” version of Agrippa (see Item #A9). This mock-up was not an edition but rather an artificially distressed used book (different from Agrippa) with a cavity cut into its back pages to hold a disk labeled “Agrippa.” The mock-up lacks etchings by Ashbaugh and features the text of the used book, not the C-A-T-G text printed for the final editions of Agrippa. There is considerable mystery over the question of the printed and existing number of copies of Agrippa. The New York Public library’s deluxe edition is editioned 12 of 95. However, 95 copies do not exist. It is known that some copies were cancelled. The Western Michigan University’s small edition copy is editioned 152 of 350. In a personal interview, the publisher disclosed that the publication of the small edition was essentially “cancelled” after its pages had been printed and that fewer copies of the small edition thus resulted than of the deluxe edition. The exact number of copies printed of each edition is unknown. Approximately 100-120 copies of the promotional prospectus were constructed by hand. The Whitney’s copy is the only prospectus known to be extant. It should be noted that the convention of labeling artist’s books X out of N copies in no way indicates that, chronologically speaking, X was the Xth copy printed out of N. That is, copy 55 of an artist’s book may have been produced earlier than copy 12. 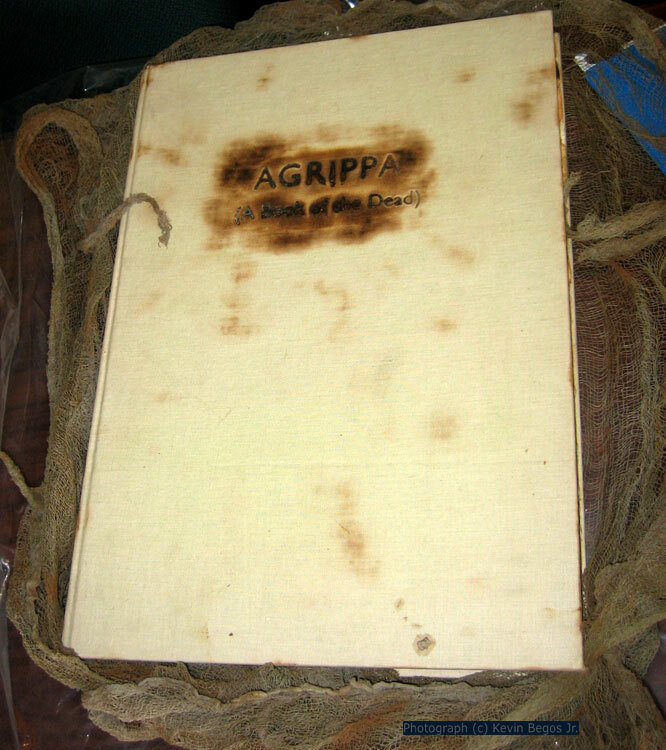 Each copy of Agrippa must be considered unique to some extent because elements of the work were handmade or hand-finished—including, for example, the burning-in of the title on the book cover, the finishing of the etchings, the creation of the overprints, and the carving of the cavity into the back pages to hold the diskette. Some of the other most obvious variants are the inclusion or exclusion of Dennis Ashbaugh’s signature on the inside cover, a variant number of overprints on Ashbaugh’s etchings, and the color (whiteish or yellowish) of the book’s front cover. The NYPL copy of the diskette bears no special markings beyond that made by its manufacturer. The diskette is black and has a “HD” logo on the right; it reads “Maxell/ Super Rd/ Mf2 hd/ Double Sided/ High Density/ Double Track/135 TPI.” (Back slashes indicate line break.) One version of the diskette included in the small edition reads “Agrippa” in white letters. Another deluxe edition is identical to the NYPL copy. Variants beyond these three diskettes are not known. The diskette is sometimes mistakenly measured at 3¾ inches instead of 3½ inches. This kind of diskette, which has 1.44 MB capacity, was first introduced in 1988 by Apple for the Macintosh IIx (16 MHz and 1-4 MB of RAM). All editions of Agrippa lack pagination. In an interview with The Agrippa Files editorial team, the publisher has asserted that all copies of each edition have the same number of pages. The NYPL deluxe edition copy has 63 pages that can be viewed. This includes 8 copperplate aquatint etchings. The final 20 pages are glued together, and a square cavity has been hollowed out in them to hold the diskette with Gibson’s poem. If these latter pages were separated, the NYPL copy would have 102 pages. (The NYPL catalogue lists the text as having 100 pages.) The Western Michigan University regular-edition copy has twenty-six leaves, or 52 pages plus 6 copperplate aquatint etchings. It is not known how many pages may be glued together at the end of the WMU copy or how many total pages comprise this edition or copy. The online catalogue entry for the Victoria & Albert Museum’s deluxe edition copy mentions 46 body pages of genetic code plus 7 copperplate aquatint etchings (14 pages including blank pages on the reverse side of each etching). As in the NYPL copy, the final 20 pages of the V&A copy are glued together. The catalogue entry does not mention the total number of pages. Fewer than 95 copies of the deluxe edition were published. Measurements and observations given here have been taken from the New York Public Library copy of the deluxe edition. The Case (top). While the Victoria & Albert Museum online catalogue notes that the two-part clamshell, dark, slate-gray case is made of kevlar (a polymer used in the manufacture of bulletproof vests), the NYPL catalogue describes the case as “composed of resin-impregnated paper and fiberglass.” The top case measures approximately 15 x 22½ x 2½ inches. The bottom 2½ inches slope at approximately thirty degrees. The surface of the top case is irregular, distressed, and looks as though it has been unearthed from the debris of some future catastrophe, a kind of relic from the future. Its size and weight do not allow for casual reading/viewing and therefore demand that one recognize its sheer artifactuality. Label on Case. A largely illegible (more legible in other copies) rectangular, slightly dirty yellow label in the upper right-hand corner reads “ALBUM/ CA. AGRIPPA/ Order extra leaves by letter and name.” The label is 2¼ x 1½ inches approximately. 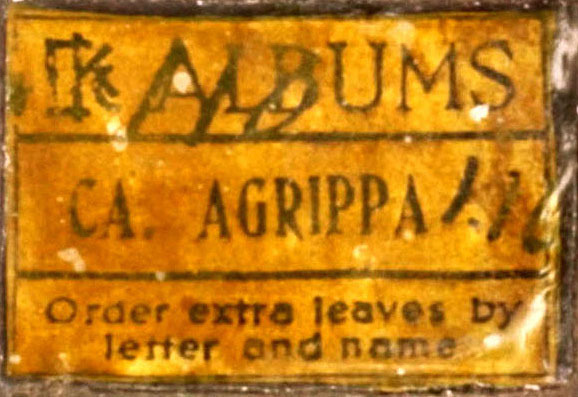 (As noted above, the name “Agrippa” on this label designates a kind of photo album marketed by the Kodak company in the 1920’s.) The upper right-hand corner of the label is 1½ inches from the top edge and 1 inch from the right edge. The label is affixed firmly by a clear polymer. The Case (bottom). The bottom of the case is also made of “kevlar” or resin-impregnated paper and fiberglass, and is similarly colored though less distressed. Its base measures 15 x 22½ inches approximately. The four-sided box frame container for the book is 14¼ x 19½ x 2 inches approximately. Its bottom edge lies 2½ inches from the container. The top edge lies approximately ? inch from the bottom case top edge. The frame is made of metal. The “Bed”. Cushioning the book is a distressed honeycomb cardboard “bed” measuring approximately 1 inch around the inside of the frame on the top, right, and left varying by as much as ½ inch; the bottom edge is 2⅛ inches long. The “bed” cavity is about 1 inch deep with a “bed” thickness of 1 inch for the book. The honeycomb has been artificially distressed: dipped in acids, apparently irregularly painted black, burned, sprinkled with metal shavings, and contains 4 loops of thick twine through the honeycomb pattern at the lower bottom edge toward the left. The Shroud. Slightly stuck, though not affixed, to the distressed honeycomb “bed” is a thin, wispy, cheesecloth “death shroud” that does not completely cover the book, thus enabling the book’s title “face” to appear almost mummified inside the case. The NYPL copy’s “shroud” measures approximately 12 x 16¼ inches, but is irregular. The Book (overall). The book itself is approximately 11⅛ x 15⅞ x 1⅛ inches. Quoting the Center for Book Arts website, “The deluxe edition of Agrippa was set in Monotype Gills Sans at Golgonooza Letter Foundry, and printed on Rives heavyweight text by the Sun Hill Press and by Kevin Begos Jr. the etchings were made by the artist and editioned by Peter Pettingill on Fabriano Tiepolo paper. The book was handsewn and bound in linen by Karl Foulkes.” The book generally looks old, artificially aged, has corner and edge burn marks with brownish/blackish spots on the cover (which has also been yellowed). (The Victoria & Albert Museum copy has a much whiter cover). The pages inside the book measure 11 x 15⅝ inches with slightly ragged edges. Some of the edges seem to have been scorched, as if by a lighter. The Book’s Cover. The NYPL copy’s cover is slightly frayed and torn in the lower left-hand corner. There is an approximately 6 inch cut along the book’s spine about 2 inches from the top. The title of the book is stamped (burned) into linen board to create a browned, seared intaglio effect. The main title, “Agrippa,” is centered, 4 inches from the top, and its letters measure 3¾ x ⅝ inches. It is set in Monotype Sans Gill font. Below the main title is the subtitle “A Book of the Dead,” which measures 4⅝ x ⅜ inches. Page 1. The recto page (page 1 in The Agrippa Files pagination scheme) is blank in the NYPL copy. Title Page (page five). The title page marks the first appearance of the DNA code found throughout much of the book. The page shows the following DNA sequence in a six-line by six-character vertical column: “AATCA / TACGA / GTTTG / CATAA / CTGAA / TTGGT”. The letters are Â¾ inches tall and offset slightly to the top and left. In his October 29, 2005, interview with The Agrippa Files team, the publisher, Kevin Begos, Jr., commented that this title page was intended to evoke books published shortly after the invention of print, whose title pages did not record publisher, place of publication, date, and other information that later became standard. He also noted that the particular DNA sequence on the title page was random. “Body Text” Pages. Pages 7-10, 13-20, 22-30, 33-40, 43-50, 53-60 (the majority of the book) each contain two columns of 42 lines with 19-20 characters per line. These columns contain the DNA sequences from the bicoid morphogen gene of the fruitfly (see The DNA Code). According to the publisher, Kevin Begos, Jr., the columns were set up to allude to the appearance of the Gutenberg Bible, though the font (Monotype Sans Gill) is modern. Page 31. Page 31 is a full-page, variegated, black-and-gray, genomic-motif copperplate aquatint etching with a black overprint image from a 1930’s-era American print advertisement. (For the source image, see item #D39.) A young boy at left holds a telephone with the wire continuing right on a horizontal line from the boy’s eye toward a largely obscured adult figure who is bending over. The title of the advertisement is at the top: “Tell Daddy we miss him” (in quotes). Below the title text are three paragraphs of printed text that are largely illegible in the NYPL copy. The first paragraph has three plus lines, the second has four plus lines and the third has three plus lines. The third paragraph is the most legible: “Why not call right now? / easy — just tell the operator where/ you want to call: she’ll be glad to/ help you.” Then at the bottom of the advertisement in a box is another text that in the NYPL copy is legible only as: “Ions .” It has approximately ten lines of illegible text with an apparently erased blank spot. Page 41. Page 41 is a full-page, variegated, lemon-yellow, genomic-motif copperplate aquatint etching. Page 49 is a page of C-G-A-T code like the other body pages in the book, but it is overprinted (in a slightly diagonal orientation) with a 1950’s-era newspaper advertisement for a television on two legs. The source image is titled “Recognized as the Height of Quality.” (See item #D36.) The advertisement image is printed on the underlying page in uncured photocopy toner, which is especially gritty and not totally affixed on this page. Page 51. Page 51 is a full-page, dirty lemon-yellow-and-black, variegated, genomic-motif copperplate aquatint etching. The DNA rectangles are noticeably darker on the left. Page 51 is noticeably torn on the bottom edge. Page 62. Page 62 is a full-page, dirty black-and-white, genomic-motif copperplate aquatint etching with no colors. The DNA rectangles blend together more and more on this page. It is the most obscure of Ashbaugh’s Agrippa designs in the NYPL copy. There appears to be a column of 45 lines of printed text on the right center of the page. Page 63. Page 63 is a “body text” page like others with the C-G-A-T DNA sequence from the bicoid morphogen gene of the fruitfly, but it is hollowed out with a 4¾ x 4¾ inch cavity that descends between ⅛ and ¼ inches deep into the underlying pages (measurement varies depending on how hard one presses down while measuring). The edges of the cavity appear to have been cut with an Exacto knife; the sharp edges here contrast with the smooth, torn quality of the edges of the book pages. Page 63 is glued to 19 other pages beneath it, which thus fuse into a solid layer serving as a platform for the diskette. (In the private, “Archive-1” copy of the book that the publisher showed to The Agrippa Files editorial team, the corner of page 63 can be turned up slightly to reveal that the underlying page 64 is printed with more of the DNA sequence, but that page 65—and by implication the rest of the glued-together pages—is blank.) The cavity contains a 3½ inch diskette (see description of the diskette above). The NYPL copy’s diskette has a clear plastic bag over it. Some uncured photocopy toner appears to have rubbed off onto Page 63 from Page 62. Blank Pages. The following pages are blank: 12, 22, 32, 42, 52, 61. These are the reverse sides of Ashbaugh’s copperplate aquatint etchings. Only one copy of a promotional “prospectus” for Agrippa: (a book of the dead) is known to be extant: the copy in the Frances Mulhall Achilles Library at the Whitney Museum of American Art in New York, New York. It consists of two parts: a two-page folder advertisement (front cover, two interior pages, and back cover) with a sample Ashbaugh etching, and a distressed honeycomb object evocative of the book itself. It was designed by Kevin Begos, Jr., and Dennis Ashbaugh. The folder advertisement measures 10 x 12 11/16 inches on off-white, handcut paper. The bottom, right, and left edges are ragged, but the top edge is clean. The front cover reads in Monotype Sans Gill type, approximately 20 point font: “William Gibson/ Dennis Ashbaugh/ Agrippa (A Book of the Dead).” (“Agrippa” is in approximately 28 point font). The first interior page contains a 3 11/16 x 3 6/16 inch color reproduction of an Ashbaugh genomic-motif image representative of his etchings in the final versions of Agrippa. The image has pink and light green colors with dark, soft DNA-gel-like rectangles, and is contained on a 8½ x 11 inch rice-paper insert. It is a dangerous and stimulating experiment when a publisher of museum quality limited edition books (Kevin Begos Jr.) brings together Dennis Ashbaugh (an artist known for his large computer virus and DNA portrait paintings) and the near-future writer William Gibson (who first coined the term “Cyberspace” in his award winning books Neuromancer, Count Zero, and Mona Lisa Overdrive) to produce a collaborative Artists Book. For in this age of megacomputers, biotechnology, and startling social and scientific change, this “Book” will be as much of a challenge as a possession, as much an enigma as a story. In the ethereal territory of the Artist/Writer collaboration, this project will be unique. The “story” will exist only on a computer disc that contains a virus that will infect the “readers” computer. Not only that, the story will start to mutate and destroy itself after one reading. The Collector/Reader can choose to access this Gibson story—and thus set in motion a process in which the story loses its digital composure and becomes only a memory—or preserve the story in its “pure” state—a Pandora’s Box whose contents remains forever unknown. Ashbaugh’s etchings will be both counterpoints and companions to the story. Printed on Antique Rag paper, their texture, smell, form, weight, and color will all be qualities that do not exist for the story in cyberspace. Yet the etchings will also go through changes after viewing, and they allude to both the allure and taboo of Genetic Manipulation. This Artists Book (which isn’t exactly a “book” at all) comes cased in an exquisite metal container full of relics suggesting rural Virginia in the 1920’s—memories of the writer’s family past. Among those relics is a tattered old book, with a hollowed space hidden in the middle that contains the computer disc. The story holds the clues that tie the relics and the Genetic etchings together. Just as the Gutenberg Bible heralded a wave of social and political change that swept through Europe, this Book/Object raises new issues of Art, Time, Information, and Possession—and raises questions our basic assumptions about books and art. Designed and constructed by Dennis Ashbaugh and Kevin Begos, Jr., the promotional prospectus is a multimedia piece of distressed honeycomb cardboard measuring 9¼ x 12¼ x ½ inches. It resembles the distressed honeycomb “bed” in the deluxe edition of Agrippa. It is irregularly painted black, has a slightly frayed and knotted piece of twine looped 7 times through the upper left side three honeycomb rows down from the top edge. There is a 4 x 1 inch irregular gap torn near the upper right edge. There is a cavity in the middle 4 inches from the top and bottom edges, and 2½ inches from the right and left edges. Sunken in the cavity is an unmarked 3½-inch black diskette embedded in a light amber yellow polymer with torn pieces of old newspaper used as backing. The text of the newspaper has been rendered illegible where it has had contact with the glue polymer. 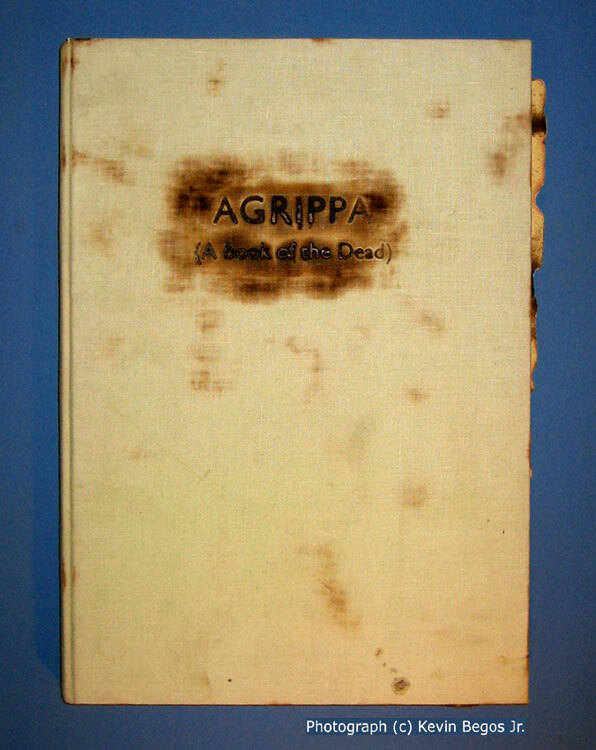 Agrippa—a book of the dead is a seminal publishing event in the long history of Artist/Writer collaborations. It challenges and pays homage to the basic traditions of fine bookmaking, art, and collecting, and suggests radical new possibilities inspired by runaway technological and social change. The “publica-  tion” will juxta-/ pose the most  hermetic form of/ limited edition  book with a/ worldwide digi-  tal transmission/ that is unprec-  edented./ The “story” will  appear only in/ digital form, on  a computer disc/ that self destructs  after one read-/ ing. The disc will  be housed in a relic from the fu-  ture,a book made/ of paper, with a  recess cut into the/ middle that holds  the disc./ Artist Dennis  Ashbaugh will/ create copper-  plate etchings/ with a new sub-  ject matter—/ DNA gene portraits. William Gibson’s books have been published in seventeen countries around the world over the last seven years, in the millions of copies. He first coined the word “cyberspace” but his writing has transcended genres and cultural boundaries. Agrippa is a unique combination of Art, Technology, and the Politics of information control and dispersal. It will the first Digital Myth. “of 33-21 82nd St. Jackson Heights who was May’s close friend and acted as his chauffeur because prohibited May from driving. This description could not have been completed without the willing assistance of several institutions and certain key individuals. I have received help from the Center for Book Arts in New York City, as well as the Waldo Library at Western Michigan University. I want to thank the Rare Books Division of the New York Public Library for access to its copy of the deluxe edition. Carol Rusk provided invaluable assistance during my visit to view a copy of the promotional prospectus at the Frances Mulhall Achilles Library at the Whitney Museum of American Art. Amy Weiss provided guidance in reading and interpreting bibliographic descriptions. Most profoundly, Kevin Begos, Jr., provided insider knowledge of Agrippa. I thank him for sharing illuminating stories about the genesis of the project and its cultural life. I want also to thank the other graduate students involved in the project for providing additional ideas and asking clarifying questions during the composition of this entry—Pax Hehmeyer, Kim Knight, David Roh, and Lisa Swanstrom. Finally, Alan Liu proofread, edited, and transcribed several drafts of the bibliographic description. I thank him for his scholarly generosity and remarkable attention to detail.